In conjunction with the exhibition Speech/Acts, on view through December 23, 2017, the Institute of Contemporary Art presents a lecture by Claudia Rankine at Lightbox Film Center (3701 Chestnut Street, Philadelphia). Registration for this lecture is sold out. Registration is required and seating is first-come, first-served, and does not guarantee a seat. This event is sponsored by the Theatre Arts Program, Africana Studies, Social Practice and Policy, and the Keith L. and Katherine Sachs Program in Contemporary Art, the Department of the History of Art, University of Pennsylvania. 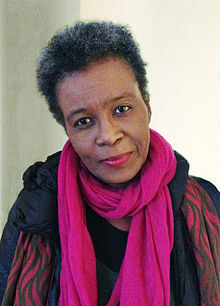 Born in Jamaica in 1963, Claudia Rankine earned her BA in English from Williams College and her MFA in poetry from Columbia University. She is the author of five collections of poetry: Citizen: An American Lyric (Graywolf Press, 2014), which received the 2016 Rebekah Johnson Bobbitt Book Prize for Poetry and the 2014 National Book Critics Circle Award in Poetry; Don’t Let Me Be Lonely: An American Lyric (Graywolf Press, 2004); PLOT (Grove Press, 2001); The End of the Alphabet (Grove Press, 1998); and Nothing in Nature is Private (Cleveland State University Poetry Center, 1995), which received the Cleveland State Poetry Prize. Her honors include the Jackson Poetry Prize, as well as fellowships from the Lannan Foundation and the National Endowments for the Arts. In 2005, Rankine was awarded the Academy Fellowship for distinguished poetic achievement by the Academy of American Poets. In 2016, Rankine was awarded a MacArthur “Genius” Grant and named a United States Artists Zell fellow in literature. She is currently a Frederick Iseman Professor of Poetry at Yale University. The Racial Imaginary Institute, founded by Rankine, is meant to capture the enduring truth of race: it is an invented concept that nevertheless operates with extraordinary force in our daily lives, limiting our movements and imaginations. We understand that perceptions, resources, rights, and lives themselves flow along racial lines that confront some of us with restrictions and give others uninterrogated power. These lines are drawn and maintained by white dominance even as individuals and communities alike continually challenge them. We are committed to the activation of interdisciplinary work and a democratized exploration of race in our lives. The Institute will take the form of a gallery and presenting space for art exhibitions, readings, dialogues, lectures, performances, and screenings that engage the subject of race. The Racial Imaginary website will function as an online portal to the activities of the Institute. All events at The Racial Imaginary Institute are open to the public.